Highs: Well produced injection molding. Clean crisp details and includes a figure. Lows: No photo etch which is typical of Tamiya armor releases. Verdict: This will most certainly build into a nice niche WW2 armor subject. I was more thinking turned or etch metal parts but I guess this set can work work fine in a absence of alternative sets to use. HI. Paul Owen at Track-Link who has very good contact at Tamiya has said that Tamiya themselves have a couple of after market items comimg for the Somua. He didn't know what these were but P/E and a turned barrel seem likely candidates. In addition to the above, a Beute version of the S35 is on its way. Cheers. No offense to Tamiya but in my experience, having gotten a few of their sets, they tend to be small, of marginal usefulness, and expensive. I'd hold out a bit for Voyager or ET Model. I can't imagine them NOT releasing a set within a very few months. 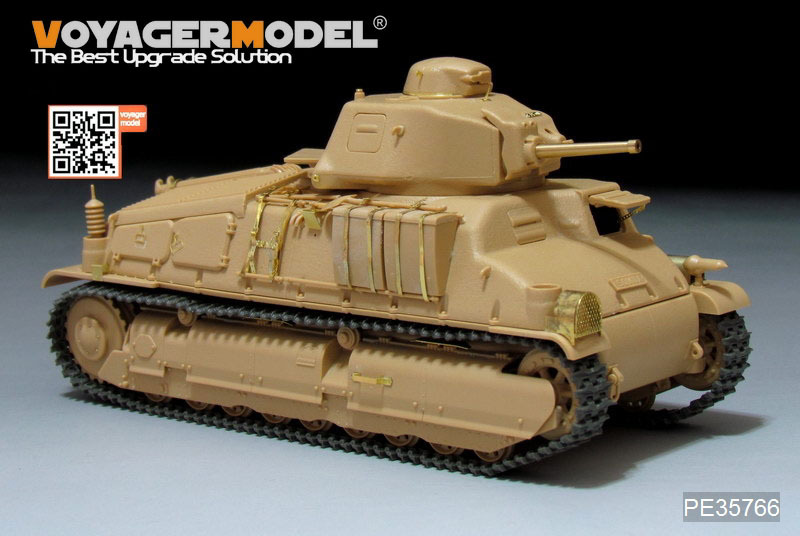 The Tamiya Somua is priced at a paltry $27 at HobbyEasy! Nice tank from Tamiya! Just wondering why they do not include the PE set from the beginning? But what intriges me is the blue commanders cupola. Had it identification purposes or was it intended as camo? I expect they are primarily catering to casual modellers who will not want the extra work involved with the PE material. I am currently working on decal set for the French-crewed vehicles. Also, The set will fix the 4th Cuirasseirs marking (both should face forward).